Claressa Shields is a winner. It’s almost all she’s ever known as a competitor. She had one loss as an amateur, posting a 77-1 mark with two world championships and two Olympic Gold medals. Now, just nine fights into her professional career, Shields has been a partially unified titlist at super middleweight and reigns as the undisputed world middleweight champion. She accomplished the latest of these with a poised, steady, dominant performance over long reigning WBO titlist Christina Hammer. Victories will keep coming for Shields in the ring but her real competition is bigger than that. Only 24, Shields is tasked with building an audience and finding compelling opposition. Saturday’s fight was a good step in the direction of the former but now that business with Hammer is concluded, the next foil will need to be found. The Future for Shields: Shields (9-0, 2 KO) mentioned two names in the post-fight interview and both could be built into successful promotions. The first name, and one she stated she’d be willing to travel for, is the UK’s Savannah Marshall (5-0, 3 KO). The 27-year old bested Shields en route to gold at the 2012 world amateurs, is trained by Peter Fury, and promoted by Floyd Mayweather. Put it all together and this is a showdown that was already being built just out of view. The other fight Shields called for, and one that could be promoted into an even bigger affair than Hammer, is a showdown with 37-year old undisputed welterweight queen Cecilia Braekhus (35-0, 9 KO). Shields expressed a willingness to come to a catchweight for a showdown. In the men’s game, clashes between the finest at welterweight and middleweight have added much to the lore of the sport. Shields-Braekhus has a narrow window where it could be realistic given the age of Braekhus but it’s a fight any fan should want to see while there is time. The Future for Hammer: Hammer’s reign as WBO titlist dated to 2010 and ends after 14 title defenses. The Kazakh-born champion flashed her quality jab and nice fundamental punching technique on Saturday but the lack of dimensions to her game were made clear early and one wondered if she would see the finish line under fire in round eight. 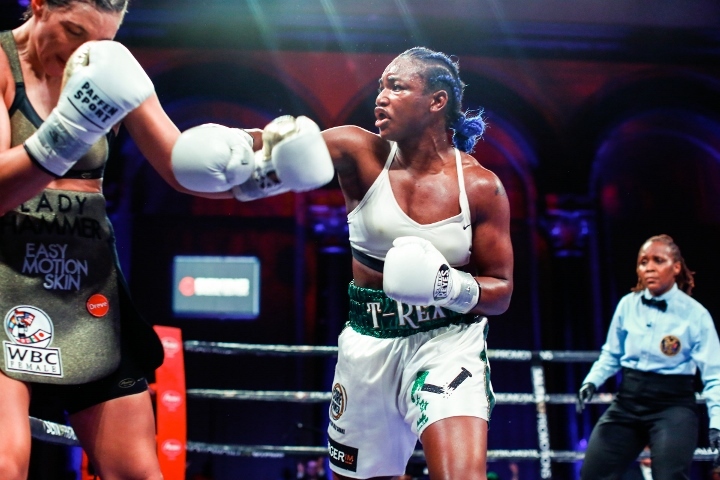 Hammer’s best move may be to go up the scale as she will surely still be a valuable commodity for endorsements in Europe and can try to win a title at super middleweight as Shields looks lower on the scale. Marshall isn't promoted by Floyd Mayweather, she left after being sat on the shelf for 10 months after making her debut on the Mayweather-McGregor undercard.